“”Day #1 – Early start to the day. Cold windy but was able to reel in 5 perch and 3 salmon. We have had a man down for several hours but he expects to have a full recovery for tonight-s agenda…another man down at 5:55pm. Face plant in food! I don-t know if we-ll make evening highlights with 2 men down. Oh Yeah, Jay is still missing! Where is he? 6:15-is there any hope of revival of the dead? Maybe another day. Long Snowmobile Season in Jackman???? I just looked at the 15 day forecast with accuweather and the temperatures will average in the 20-s the next 15 days and actually, I did not see any days that it will go above 30. Although it does not say any snow amounts, they are calling for snow at least 5 out of those 15 days…that will take us well beyond the middle of March with great snow and trail riding. So if you missed riding in early January, come on up to Jackman for some great snowmobiling this March. The days are already getting longer and the sun is getting warmer….great time to ride. 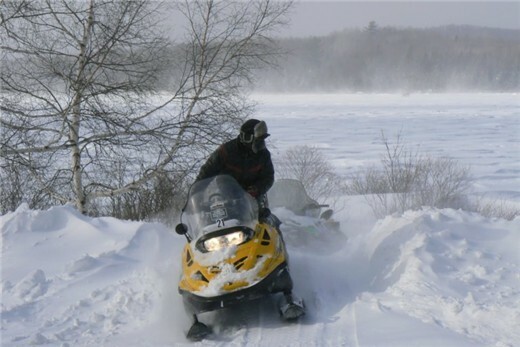 This is a photo of our guest, Jim, making a trail off the lake to his cabin here, 2 days after our storm last week. Since the storm, it has been pretty busy around here so I apologize for not adding any updates until now. 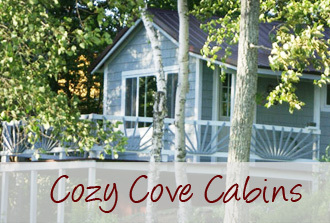 They say we had about 30 inches from that storm but around Cozy Cove Cabins, we could not tell. Half of the snow from the lake blew onto our property I think 😆 We were able to get the area plowed but we did need an excavator to help move up and over. Plus all the other snow we had to move: roofs, decks, etc. Trail reports have been great. Our guests have gone into Canada, over to Pittston Farms, and down to Eusits. The beginning of the weekend had some rough spots but now that the snow had a chance to harden up and groomed again and again, they have been great. 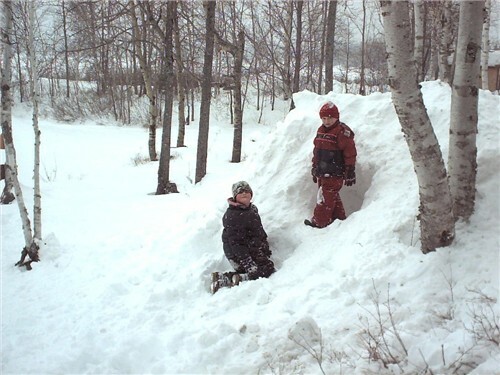 Kids this weekend were building forts in the snow mounds and sliding down the other side. What fun! The wind picked up sometime last night so when we woke….oh wow, what a sight. It was still snowing but the wind was blowing so hard that we believe half of the snow that fell on the lake was on our property! Steve wondered if he wasted his time plowing last night or thankful that he moved as much as he did. One of our guests made the mistake of leaving their sleds out all night. Even though they put one behind their trailer, the sled was buried this morning. It is unsure how much snow we actually got in the region because of the wind. Perhaps someone in town may have an idea. So we have been plowing and blowing (which using a snow blower when it is windy does not really work well) and shoveling all morning. Now the sun is out and it sure is pretty. If you are on your way up to the region today or this weekend, drive careful as the winds are blowing much snow onto the roads. The plow trucks are doing a great job with the roads but their still may be drifts. And no matter where you are staying this weekend, be kind to your hosts as they must of all had a busy day today trying to make room for you and your trailers. I did get pictures this morning and will try to post them later but for now, back to work! Well finally, here is one picture we took Thursday Morning before we started to plow. Today, it was even worse so we had an Excavator come in to help move some of the snow! The winter storm is on it-s way. This morning we had about 4 inches by 9am. At 6pm, I was shoveling off our deck for the second time today, and it began to snow harder so that by the time I was done, there was another inch down where I had cleaned off first. Now at 8pm, I measured a total of 16 + inches on our deck. The wind has not started yet so who knows what tomorrow will bring. 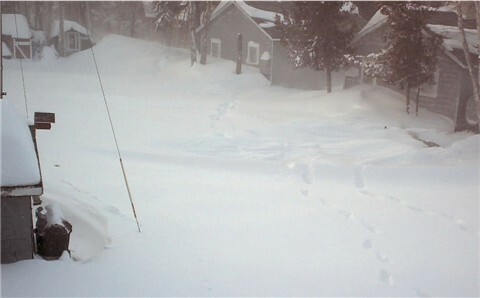 Steve is still outside plowing our drive area…his fourth run at the place. It is cold out but luckily, no wind today. I guess no valentine dinner for us tonight! YEAH!!!! A storm is coming. . . Supposed to start tomorrow and continue through Thursday. If you are on your way up, travel safe! I-ll try to update this or the weather tab tomorrow night or Friday. If it is not too windy, I-ll catch a video for those of you not able to enjoy this white stuff we love up here. Big Wood Lake was alive today with Ice fisherman riding their sleds, their Quads, and their vehicles to find that perfect fishing spot. And they are all doing great…well most. This is the Fishing Derby weekend too so I wonder who will win the big prize. I have been away a week and many of our website things have not been updated…I apologize for this. But I returned today and wanted to add a little note to Mom-s everywhere…or should I say to those of you who still have your Moms. “”Mae”” or “”Maniu”” as the grandkids called her was full of life, warm, gentle, loving and not only a great Mom but a great friend (she had many) to those who knew her. Even though she was 87, she was alert, bright, smarter than me in many ways, loved to still be able to teach her children something new she learned, happy, always smiled and she loved to laugh. 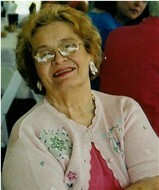 She would always tell me (dumb) jokes she heard….at least she could remember the punch lines. She loved to hear about my day no matter if it was good or bad. She always enjoyed the tales of our guests: who got how many fish, or if anyone got a Buck, or if their was snow on the ground and of course, a daily weather report was always a part of our 6pm calls. She frequently would ask about certain regulars who came to stay with us as over the years; she got to know them through me and always remembered to ask. I, as many of our guests and friends who know me knew, was very close with my Mom and there is such a void in my heart with her leaving us. She was my heart. I think the death of anyone you love is hard to accept but especially when they were not ready to die or you were not ready to let them go. So I hope that all who read this, take time every day or at least more often then you do now, to call your Mom, tell her you love her, ask her advice (even though you really don-t want it), tell her about your life (at least things she would enjoy to hear) and simply treasure the moments you have with her. Please do not wait until Mother-s Day or her birthday or when you “”get time””. Time is a precious thing that can be taken away from us at any moment. Cherish every moment with her and any of your loved ones in some way.